Cox Scrub Conservation Park (formerly Cox's Scrub National Park) is a protected area in the Australian state of South Australia located in the gazetted localities of Ashbourne and Nangkita about 55 kilometres (34 mi) south of the state capital of Adelaide. The conservation park consists of land in sections 1972 and 1979 to 1985 in the cadastral unit of the Hundred of Kondoparinga. On 5 March 1970, it was proclaimed under the National Parks Act 1966 as Cox’s Scrub National Park. On 27 April 1972, it was reconstituted as Cox Scrub Conservation Park upon the proclamation of the National Parks and Wildlife Act 1972. As of 2018, it covered an area of 5.44 square kilometres (2.10 sq mi). The park is in a minimally disturbed condition, the only previous landuse being beekeeping. Few introduced plant species are found in the park, rabbits are plentiful. It is classified as an IUCN Category III protected area. In 1980, it was listed on the now-defunct Register of the National Estate. ^ a b c "Terrestrial Protected Areas of South Australia (refer 'DETAIL' tab )". CAPAD 2016. Australian Government, Department of the Environment (DoE). 2016. Retrieved 21 February 2018. ^ a b "Search results for 'Cox Scrub Conservation Park' with the following datasets selected – 'Suburbs and Localities', 'NPW and Conservation Boundaries', 'Hundreds' and 'Gazetteer'". Location SA Map Viewer. South Australian Government. Retrieved 19 December 2018. ^ a b c Hall, Steele (5 March 1970). "NATIONAL PARKS ACT, 1966: HUNDRED OF KONDOPARINGA - COX'S SCRUB NATIONAL PARK" (PDF). The South Australian Government Gazette. Government of South Australia. Retrieved 19 December 2018. ^ a b "Protected Areas Information System Reserve List" (PDF). Government of South Australia. 9 March 2018. Retrieved 26 April 2018. ^ "No. 56 of 1972 (National Parks and Wildlife Act, 1972)". The South Australian Government Gazette. Government of South Australia: 660 & 701. 27 April 1972. Retrieved 27 February 2018. ^ a b "Cox Scrub Conservation Park - listing on the now-defunct Register of the National Estate (Place ID 6620)". 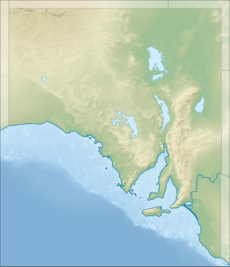 Australian Heritage Database. Department of the Environment. 21 October 1980. Retrieved 8 July 2018. This article incorporates text by Commonwealth of Australia available under the CC BY 3.0 AU licence. This page was last edited on 2 March 2019, at 07:20 (UTC).